Thousands of people have been killed by the terrorists and millions have been injured. I am just one of them. So here I stand, one girl among many. I speak not for myself, but so those without a voice can be heard. Those who have fought for their rights. Their right to live in peace. Their right to be treated with dignity. Their right to equality of opportunity. Their right to be educated. 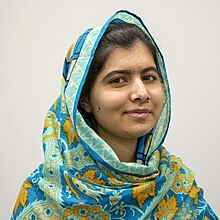 Malala Yousafzai (Urdu: ملالہ یوسفزئی‎; born 12 July 1997) is a Pakistani human rights and education activist who was jointly awarded the 2014 Nobel Peace Prize with Kailash Satyarthi, becoming its youngest recipient ever, at the age of 17. I had a terrible dream yesterday with military helicopters and the Taliban. I have had such dreams since the launch of the military operation in Swat. My mother made me breakfast and I went off to school. I was afraid going to school because the Taliban had issued an edict banning all girls from attending schools. Only 11 students attended the class out of 27. The number decreased because of Taliban’s edict. On my way from school to home I heard a man saying “I will kill you.” I hastened my pace and after a while I looked back if the man was still coming behind me. But to my utter relief he was talking on his mobile and must have been threatening someone else over the phone. In a situation where a lifelong school break was being imposed upon us by the terrorists, rising up against that became very important, essential. It is my dream that one day, great buildings like this one will exist in every corner of the world so every child can grow up with the opportunity to succeed. The content of a book holds the power of education and it is with this power that we can shape our future and change lives. Birmingham is very special for me because it is here that I found myself alive, seven days after I was shot... It is now my second home, after my beloved Pakistan. We must speak up for the children of Pakistan, India and Afghanistan who are suffering from terrorism, poverty, child labour and child trafficking. Let us help them through our voice, action and charity. Let us help them to read books and go to school. And let us not forget that even one book, one pen, one child and one teacher can change the world. Even if there was a gun in my hand and he was standing in front of me, I would not shoot him. This is the compassion I have learned from Mohamed, the prophet of mercy, Jesus Christ and Lord Buddha. This the legacy of change I have inherited from Martin Luther King, Nelson Mandela and Mohammed Ali Jinnah. This is the philosophy of nonviolence that I have learned from Gandhi, Bacha Khan and Mother Teresa. I don’t know where to begin my speech. I don’t know what people would be expecting me to say, but first of all thank you to God for whom we are equal and thank you to every person who has prayed for my fast recovery and new life. Dear friends, on 9 October 2012, the Taliban shot me on the left side of my forehead. They shot my friends, too. They thought that the bullets would silence us, but they failed. And out of that silence came thousands of voices. The terrorists thought they would change my aims and stop my ambitions. But nothing changed in my life except this: weakness, fear and hopelessness died. Strength, power and courage was born. I am the same Malala. My ambitions are the same. My hopes are the same. And my dreams are the same. Dear sisters and brothers, I am not against anyone. Neither am I here to speak in terms of personal revenge against the Taliban or any other terrorist group. I am here to speak for the right of education for every child. I want education for the sons and daughters of the Taliban and all the terrorists and extremists. I do not even hate the Talib who shot me. Even if there was a gun in my hand and he was standing in front of me, I would not shoot him. This is the compassion I have learned from Mohamed, the prophet of mercy, Jesus Christ and Lord Buddha. This the legacy of change I have inherited from Martin Luther King, Nelson Mandela and Mohammed Ali Jinnah. This is the philosophy of nonviolence that I have learned from Gandhi, Bacha Khan and Mother Teresa. And this is the forgiveness that I have learned from my father and from my mother. This is what my soul is telling me: be peaceful and love everyone. Dear sisters and brothers, we realise the importance of light when we see darkness. We realise the importance of our voice when we are silenced. So let us wage a glorious struggle against illiteracy, poverty and terrorism, let us pick up our books and our pens, they are the most powerful weapons. One child, one teacher, one book and one pen can change the world. Education is the only solution. My father says that education is neither Eastern or Western. Education is education: it's the right of everyone. The thing is that the people of Pakistan have supported me. They don't think of me as Western. I am a daughter of Pakistan and I am proud that I am a Pakistani. On the day when I was shot, and on the next day, people raised the banners of 'I am Malala'. They did not say 'I am Taliban'. They support me and they are encouraging me to move forward and to continue my campaign for girls' education. I think that it's really an early age...I would feel proud, when I would work for education, when I would have done something, when I would be feeling confident to tell people, 'Yes! I have built that school; I have done that teachers' training, I have sent that (many) children to school'...Then if I get the Nobel Peace Prize, I will be saying, Yeah, I deserve it, somehow...I want to become a Prime Minister of Pakistan, and I think it's really good. Because through politics I can serve my whole county. I can be the doctor of the whole country...I can spend much of the money from the budget on education," she told It appears that becoming prime minister is a means to the end she has dedicated her life to...[in recalling when she got shot] He asked, 'Who is Malala?' He did not give me time to answer his question...He fired three bullets...One bullet hit me in the left side of my forehead, just above here, and it went down through my neck and into my shoulder...But still if I look at (it), it's a miracle...A Nobel Peace Prize would help me to begin this campaign for girls' education...But the real call, the most precious call, that I want to get and for which I'm thirsting and for which I want to struggle hard, that is the award to see every child to go to school, that is the award of peace and education for every child. And for that, I will struggle and I will work hard. I think I have more plans for my future from now and I think we must start work for a campaign now so we have set up a Malala foundation. And through Malala fund we are going to educate girls and we want to do work on the ground: building schools, teachers, training, trying to motivate parents of the children to send their children to school. We also want to recognize those girls who are fighting for their rights. In the future when I grow older, much older I want to do politics. I want to serve my country for politics. I want to help my people and I want to help in education. First of all, my father inspired me...he is a great social activist and women's rights activist...he spoke out. And he spoke for women's rights...that hard situation, he inspired me, because he spoke. And that's what I learned from him. I think....living in such a hard situation when there are terrorists and they slaughter people every night is still hard -- is still a threat. So it's a better idea to speak out for your rights and then die...we will speak out for our rights. This is what we can do, and we tried our best. It does not matter what’s the color of your skin, what language do you speak, what religion you believe in. It is that we should all consider each other as human beings and we should respect each other and we should all fight for our rights, for the rights of children, for the rights of women and for the rights of every human being. I’m feeling honored that I am being chosen as a Nobel laureate and I have been honored with this – this precious award, the Nobel Peace Prize. And I’m proud that I’m the first Pakistani and the first young woman or the first young person who is getting this award. It’s a great honor for me. And I’m also really happy that I’m sharing this award with a person – with a person from India whose name is Kailash Satyarthi and his great work for child’s right, his great work against – against child slavery. Totally inspires me and I am really happy that there are so many people who are working for children’s right and I’m not alone. And he totally deserved this award. So I am feeling honored that I’m sharing this award with him. He received this award and we both are the two Nobel award receivers, one is from Pakistan, one is from India, one believes in Hinduism, one strongly believes in Islam. And it gives a message to people – it gives a message to people of love between Pakistan and India and between – between different religions and we both support each other. A girl has the power to go forward in her life. And she’s not only a mother, she’s not only a sister, she’s not only a wife. But a girl has the – she should have an identity. She should be recognized and she has equal rights as a boy. [T]hrough my story I want to tell other children all around the world that they should stand up for their rights. They should not wait for someone else and their voices are more powerful. Their voices – it would seem that they are weak, but at the time when no one speak, your voice gets so loud that everyone has to listen to it. Everyone has to hear it. So it’s my message to children all around the world that they should stand up for their rights. This award is not just for me. It is for those forgotten children who want education. It is for those frightened children who want peace. It is for those voiceless children who want change. I am here to stand up for their rights, raise their voice ... it is not time to pity them. It is time to take action so it becomes the last time that we see a child deprived of education. Sometimes people like to ask me why should girls go to school, why is it important for them. But I think the more important question is why shouldn't they, why shouldn't they have this right to go to school. The world can no longer accept, the world can no longer accept that basic education is enough. Why do leaders accept that for children in developing countries, only basic literacy is sufficient, when their own children do homework in Algebra, Mathematics, Science and Physics? Why is it that countries which we call strong" are so powerful in creating wars but are so weak in bringing peace? Why is it that giving guns is so easy but giving books is so hard? Why is it, why is it that making tanks is so easy, but building schools is so hard? No child should have to die for going to school, Nowhere should teachers fear to teach or children fear to learn. Together, we can change this picture. … And together let us follow the lead of this brave young girl, Malala. Let us put education first. Malala is a brave and gentle advocate of peace who through the simple act of going to school became a global teacher. She said one pen can change the world – and proved how one young woman can lead the way. With her courage and determination, Malala has shown what terrorists fear most: a girl with a book. Malala is a daughter of the United Nations, from participating in UNICEF events years ago to marking the 500-day countdown to the Millennium Development Goals with us at UN headquarters this summer. The United Nations will continue to stand with her against extremism and for the right of girls everywhere to be free of violence, to go to school and to enjoy their right to an education. … I congratulate both leaders for this well-deserved recognition. The true winners today are the world’s children. Ban Ki-moon, "Statement on the Awarding of the Nobel Prize for Peace to Malala Yousafzai and Kailash Satyarthi" in un.org, 10 October 2014. The Norwegian Nobel Committee has decided that the Nobel Peace Prize for 2014 is to be awarded to Kailash Satyarthi and Malala Yousafzay for their struggle against the suppression of children and young people and for the right of all children to education. … Despite her youth, Malala Yousafzay has already fought for several years for the right of girls to education, and has shown by example that children and young people, too, can contribute to improving their own situations. This she has done under the most dangerous circumstances. Through her heroic struggle she has become a leading spokesperson for girls’ rights to education. … The Nobel Committee regards it as an important point for a Hindu and a Muslim, an Indian and a Pakistani, to join in a common struggle for education and against extremism. … The struggle against suppression and for the rights of children and adolescents contributes to the realization of the “fraternity between nations” that Alfred Nobel mentions in his will as one of the criteria for the Nobel Peace Prize. Nobel Committee, "Official announcement of The Nobel Peace Prize for 2014," at nobelprize.org, 10 October 2014. I want to congratulate Malala Yousafzai and Kailash Satyarthi on winning the Nobel Peace Prize. Today’s announcement is a victory for all who strive to uphold the dignity of every human being. In recognizing Malala and Kailash, the Nobel Committee reminds us of the urgency of their work to protect the rights and freedoms of all our young people and to ensure they have the chance to fulfill their God-given potential, regardless of their background, or gender, or station in life. At just 17 years old, Malala Yousafzai has inspired people around the world with her passion and determination to make sure girls everywhere can get an education. When the Taliban tried to silence her, Malala answered their brutality with strength and resolve. Michelle and I were proud to welcome this remarkable young woman to the Oval Office last year. We were awe-struck by her courage and filled with hope knowing this is only the beginning of her extraordinary efforts to make the world a better place. … Malala and Kailash have faced down threats and intimidation, risking their own lives to save others and build a better world for future generations. They come from different countries, religious backgrounds, and generations — a Muslim and a Hindu, a Pakistani and an Indian – but they share an unyielding commitment to justice and an unshakeable belief in the basic dignity of every girl and boy. Even as we celebrate their achievements, we must recommit ourselves to the world that they seek – one in which our daughters have the right and opportunity to get an education; and in which all children are treated equally. Today, we honor Malala and Kailash’s achievements, and reaffirm that the United States will always stand with those who defend our universal human rights. Barack Obama, "Statement by the President on Malala Yousafzai and Kailash Satyarthi Winning the 2014 Nobel Peace Prize" at whitehouse.gov, 10 October 2014.